Great no-mess creativity and good for travel! We bought two plastic travel boxes with the Color Wonder markers and Color Wonder coloring books in them for our children to use in the car on long trips. Our oldest at 4 years old is very neat so we haven't needed anything like this before. But our youngest at 1.5 years old is one of the messiest children I've ever known. She gets markers all over her much less everywhere else! And she loves to color, draw, paint, etc. So this is the perfect thing for her to express her artistic side without all the worry of her getting it everywhere and damaging carpet, furniture, computers, etc. She is learning to be careful with these without us having to be too strict on her use. It is a great tool when teaching your child to be careful and neat with markers. It is great to have in the car as well because it won't damage the carpet or upholstery while you're riding down the highway without any knowledge of the rogue marker without its cap being thrown into the floorboard amongst other toys. The children think it's really neat that the markers take a few seconds to change color on the paper. It is quite expensive for the special paper, which the markers only work on. I bought this for my 20 month old to let her do the paint but on days when I didnt have time to clean up the mess. However, there is as slight delay from the moment the magic paint hits the magic paper, and she was too young to understand the wait for it. It wasnt worth it for her. But i gave it to my 3 year old niece and nephew and they loved it. What a waste of plastic! My eight year old enjoyed this toy for about 20 minutes, then we threw it out. If it sprayed real paint, it might be OK, but it only works on the special paper and the results are not at all aesthetically pleasing: faded stencil shapes on icky paper. Why bother? I cannot say enough good things about Crayola Color Wonder. I have 2 very imaginative and creative kids, but the youngest likes to get creative in places I'd rather she didn't. Color Wonder saves my floors, walls, and furniture from her creativity! I like the markers the best for the kids. the paint tends to get glopped on pretty thick by my 4 year old and the crayon sticks are very hard to twist up. My 4 year old loves to color with big sisters markers but again, it ends up on her hands, face and clothes. These I can give her with the special paper and she is happy because she gets to use markers, and I am happy that I can get other housework done and not worry about her making a mess. I recomment Color Wonder to any parent out there. 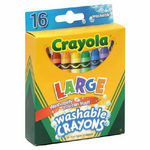 It does cost more but I often find them on sale at closeout places or I use coupons for craft stores to buy them. I also request them as gifts instead of other toys that get forgotten about in a few days. Color Wonder is here to stay in our house. All the creativity, none of the mess! As a mother of a two and five year old, I'm always looking for toys they can play with together. This definately fits! No mess creativity with packets that provide learning opportunities like numbers & letters. I would definately recommend this to any parent of small children, especially if you travel. These would have saved me a world of trouble when I was a kid! 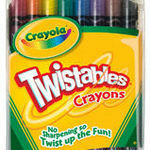 The color wonder markers are one of Crayola's greatest inventions. The kids can be imaginative and color to their hearts content, all without messing up the floors, walls, tables, cabinets, doors, cat, and any of their siblings! Yes, there have been a few times when I put my then infant - toddler boys down for naps only to find one of them later covered with black permanent marker and the other smiling oh so innocently! With choices of coloring books or blank pages of the special Color Wonder paper, these markers can do everything traditional markers do, but without the mess! The paper and books are a bit on the expensive side, but I have been able to find some really great deals as long as I pay attention and remember to take a look in the crayola aisle whenever I am at the store. 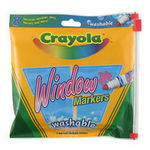 Had these markers been around when I was a kid it would have saved me countless hours of scrubbing walls. 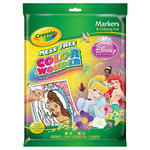 Markers can ONLY mark on Color Wonder paper...NOWHERE ELSE! If your child has issues with coloring on everything BUT the paper provided, then Color Wonders by Crayola is EXACTLY what you need. The special markers can only show up on the Color Wonder paper. They come in classic colors as well as pastels. My daughter loves these because they are different, and she NEVER worries when she puts the marker down on her bed without the lid! Perfect Quite Occupying Activity for youngsters anywhere! This is one of the best items we take to church with us. It can be purchased in it's own little briefcase, with the markers that don't color on anything but the color wonder paper! Each color marker puts that color on the paper, but only "in the lines". So it doesn't teach them how to stay in the lines, but it does allow them to color with markers, which is a big deal to a little person! This also allows us as parents to guide them if they move off the paper back onto the paper. This product is wonderful! Let your kids be creative without worring about the mess. These product are great they have markers, finger paints, paint brushes and so much more in the line of the color wonder products for children. These are fun easy ways to let your kids be creative without having to worry about them marking a mess or marking on the wall or funiture. They cost slightly more than the other products but it is so worth it when you consider not haveing to waste time cleaning marks off the wall. I would recommend this product to anyone that have small children and they are still learning on what they can and can't paint or draw on or simly the control of keeping it on the paper. They can still let their creativity out and you can relax.